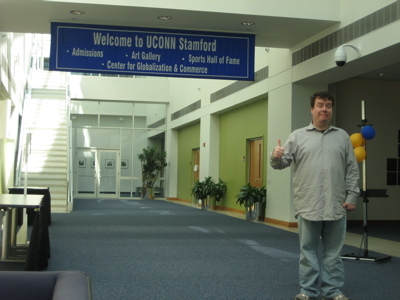 Since the Connecticut Sports Hall of Fame disappeared* with the renovations at the Hartford XL (Civic) Center, I’m forced to go to smaller, more localized halls of fame. I uncovered a gem in Middletown (CTMQ Visit here) and know of a few other town HoF’s, but this is the only county one of which I’m aware. And really, when you think of sporting meccas, Fairfield County jumps to the top of everyone’s mind. There’s Mike Gminski for cryin’ out loud! But really, I just want to make fun of Bruce Jenner. He spent a few years in Newtown and as everyone knows, he’s certainly deserving of being in the Fairfield County Sports Hall of Fame. It’s just that these days, due to some awful plastic surgery, he’s become a go-to joke when discussing Hollywood plastic surgery victims. I’m not sure how I’ll properly bust on Jenner here yet, but it’ll come to me. 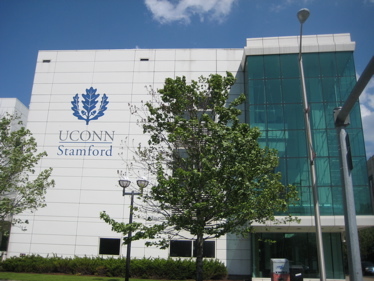 UConn has several campuses around the state and Stamford’s has undergone a rather nice recent makeover. 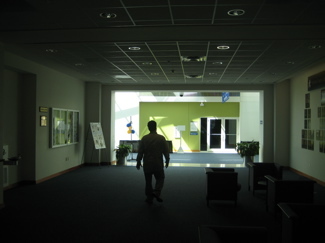 The Stamford Campus was founded in 1951, to provide education for GIs returning from the Korean War. 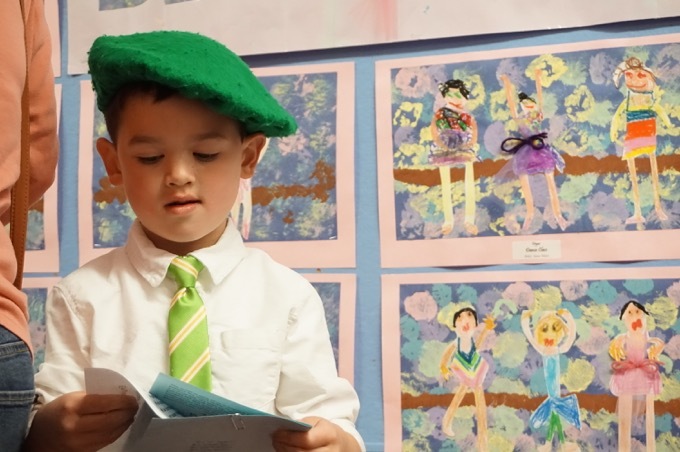 The campus offers four-year undergraduate degrees in ten majors: AmericanStudies, Business and Technology, Economics, English, General Studies, Human Development and Family Studies, History, Political Science, and Psychology. At the graduate level, the campus offers the Master of Business Administration (MBA), and the Executive Master of Business Administration (EMBA) degrees. 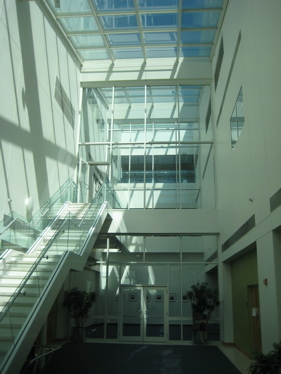 The Stamford campus’ location in lower Fairfield County provides access to internships, field placements and jobs with Fortune 500 companies, investment and banking institutions, non-profit organizations, and civic, education and community agencies. 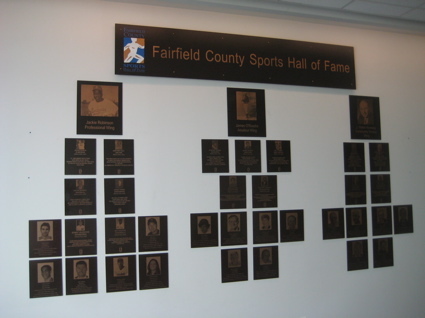 The FFC HoF is broken down into four parts: The Jackie Robinson Professional Wing (Jackie lived in Stamford for years, as mentioned here, on my Freedom Trail report), the James O’Rourke Amateur Wing, the J. Walter Kennedy Community Service Wing, and a special UConn HoF area. In reality, there are no “wings,” but rather just a different section of plaques separated by a foot of wall space. But “wings” do sound much more important. And this is important stuff. Where else is former UConn captain – and National Champion thankyouverymuch – Rashamel Jones honored? Of course, Rash wasn’t actually from Stamford, or even Connecticut, but he played his high school ball at a private school in Stamford and I guess that counts. Rather incredible he’s still the leading scorer there, after guys like Ray Allen, Donyell Marshall, Ben Gordon, and Emeka Okafor have come through – albeit none of them played for the four years that Smith did. There are a bunch of soccer players in the UConn wing that none of us have ever heard of, but it’s the newest wing, so it’ll only grow. Oh yeah, Tommy Penders (from Stratford) is in here too, and he’s a rather legendary coach and former player. Penders played both basketball and baseball for the University of Connecticut, and is one of the few players to have competed in both the NCAA Tournament as well as the College World Series. He went on to coach a bunch of college programs and his biggest achievement was turning around Texas from nobody nothings to a national player. The Jackie Robinson Professional Wing contains the most well-known honorees. Guys like Calvin Murphy (Dallass Cowboys) and Steve Young (USFL’s Los Angeles Express and the Tampa Bay Buccaneers… and oh yeah, the 49ers). Did you know that Steve Young is the great-great-great- grandson of Brigham Young? I didn’t and feel dumb about that. The Mormon Church is exceedingly happy that Young is a tithing Mormon. 10% of his millions must pay for a lot of blond haired blue-eyed security in Utah. Guys like Charles Nagy (UConn and Cleveland Indians), Mo Vaughn (Red Sox), Bobby Valentine (Lots in baseball) and Mike Gminski. 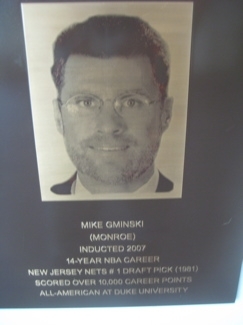 Gminski went to Duke, which is borderline illegal now in Connecticut, but went on to play many years in the NBA. He kind of stunk, but almost all Dukies do in the NBA. I’ll give extra special props to Chris Drury, who could also be in here in the Amateur Wing for his Little League heroics. His outstanding athletic achievements started as a youngster when he led Trumbull to the Little League World Series title in 1989. He then was named college hockey’s most outstanding player in winning the Hobey Baker Award after a stellar career at Boston University. Drury won the Calder Trophy as NHL Rookie of the Year in 1999 with the Colorado Avalanche, and then won a Stanley Cup two years later with the Avs. 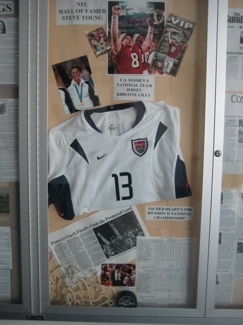 The Fairfield Prep graduate also played for Team USA in the Olympics in 2002 & 2006. Drury has 218 career goals and his reputation as a clutch post-season performer is borne out by his 46 playoff goals, including 16 game-winners. Finally, we come to the amateur wing. 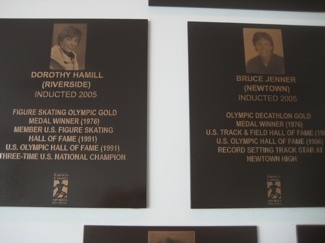 I’d only heard of two inductees (Dorothy Hamill and Jenner), but there is a woman you should all know. Joan Joyce is just awesome. Joyce is widely recognized as the greatest softball player of all time. Her 17 seasons with the world-famous Raybestos Brakettes produced some of the most memorable moments in both her career and the organization’s history. During her stint with the team, Joan won 429 games, while losing just 27. She struck out 5,677 batters, threw 105 no-hitters, and had 33 perfect games. Her career ERA was just 0.21, and she showed her amazing versatility with a .327 career batting average. She led the team in batting six times, while hurling the Brakettes to 11 national championships. Beyond softball, Joyce went on to enjoy a 19-year career on the LPGA tour, and is listed in the Guinness Book of World Records for the fewest number of putts in a pro round (17), for both men and women. Joan also was a three-time AAU basketball All-American, setting a national tournament record with 67 points in a single game in 1964. She also played on the 1965 US Women’s basketball team. Joan continued her multi-sport career as a player-coach in the United States Volleyball Association for four years, and became a CT state champion in bowling, just three months after picking up the sport. Holy crap. Joan did even more, which you can read more about here. Which brings us to the fascinating Mr. Jenner. He’s hardly from Fairfield County, having just gone to high school in Newton there for a couple years. He went on to win the decathlon in the 1976 Olympics and used his boyish good looks to gain fame in a variety of arenas – TV, movies, advertising, motivational speaking, etc. In his more recent life, however, Jenner has become a joke. A reality TV hack, spawning and step-fathering other reality show hacks. His marriages and divorces and children and step children are all a great big mess. A very rich mess, but still… A mess. But not as big of a mess as his atrocious face. He’s undergone a bunch of plastic surgery and now looks like an old woman who suffered a stroke and had a dead raccoon land on his head. In the end, perhaps his most proud achievement will be his Fairfield County Sports Hall of Fame induction. As it should be. 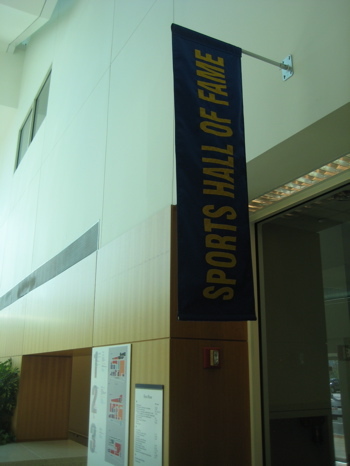 *I’ve heard a rumor that a large part of the State Sports Hall of Fame is displayed at the hotel attached to Bradley Airport. Love your blog! Read about you in Connecticut magazine and have been hooked ever since. 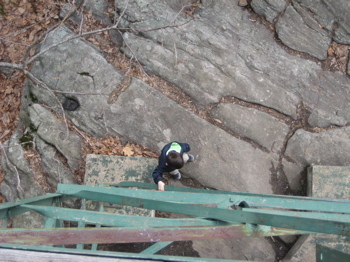 I am a total amateur, I don’t think I could hike for 2 miles without keeling over but I want to try some of your hikes. I have teenagers now but wish I had your blog when they were younger. I was always taking them somewhere in CT. I am from New Haven county and especially like your entries from there. Also, I am a big UCONN fan and love your shots at the Dukies. Have you seen JJ Reddick on the Magic with the spiked hair? Too funny!! Keep this blog going, now it is my husband and I starting to explore the state together. For your son, I would suggest “No Child Left Inside”. I am sure you know about it, but I took my girls the first 4 years and they explore one park per week and it is really cool. Nice website too.